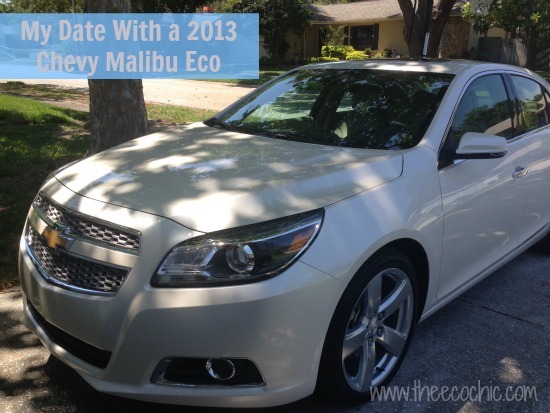 A few weeks ago we had the privileged of borrowing a brand new 2013 Chevy Malibu Eco for a week. If you follow The Eco Chic on Instagram you got a sneak peek inside the Malibu and the adventures we went on. The Malibu got to tag along as I drove the kids to school, karate, the library, the grocery store and all the other fun places we visit each week. I’ve personally never had a brand spanking new car of my own (all of mine have been about 1-2 yrs old upon purchase) so being spoiled with a fully loaded brand new (only 400 miles when I got it) car was a real treat. Anyone else like that “new car” smell? I’m currently driving a 2005 Honda Accord so I was completely impressed with all the technological advances in the Malibu. Keyless entry wasn’t anything new but the push-to-start was a nice surprise. As a parent I think my favorite feature is the rear vision camera so that I could see everything that my mirrors might miss – like small toys, bikes, or children. It was probably the most helpful feature at school drop-off and pick-up to know that there weren’t any little kids behind me. My oldest was impressed with the rear power outlet (a real plug) so he could charge his iPad on the way to school (he always forgets to recharge it overnight). This came in really handy on our weekend trip to Disney World. Sure it’s only a 2 hour drive but my kids electronics were fully charged to keep them entertained. For me and all of my devices I was excited to have my charging and plug-in station in the arm rest. I could keep my phone charged and connected to Bluetooth for a safe, hands-free drive to school. I could plug it in with the 12 Volt plug, USB port, or AUX input and charge or listen to my favorite songs on my iPhone or Pandora. This is something that my Honda doesn’t offer (since it’s an older model) and one thing that makes me drool over newer cars. I hate listening to the regular radio stations and couldn’t even tell you what the local stations are. I enjoyed having SiriusXM again (my subscription has expired) but I really enjoyed having the ability to listen to songs from my phone. 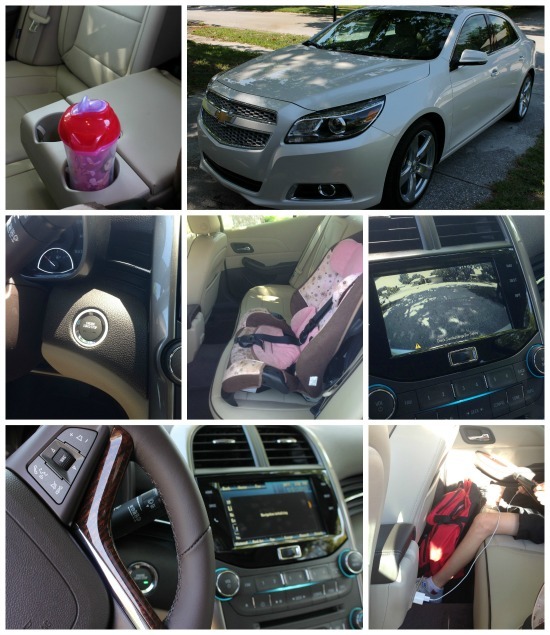 I drool over cool technology and the Chevy Malibu Eco did not disappoint me! With it’s color touch radio screen, navigation system, and OnStar there isn’t much that the Malibu can’t do – besides drive itself (although it does have cruise control). The car has so many cool technological advances (like the eAssist technology) that displays when you are driving in an fuel-efficient mode. This Power Flow display will show as green when you are driving at the ideal speed without excessive stopping and starting. The Malibu Eco was a fun car to drive for a week. It fit our family and our lifestyle well. With 2 kids and a car seat it was roomy enough in the backseat to seat three comfortably if we needed to. I was a chaperon for a school field trip (to the beach – jealous?) and three 4th grade boys fit in the back without having to worry about catching cooties from one another. Extra features like the center arm rest and dual cup holder in the back made it a dream come true for a mom of 2. It serves as a barrier between the 2 of them (no fighting because “he touched me!”) and they didn’t have to fight over the cup holder (since there were 2). Chevy knows how to keep kids (and moms) happy! Holy trunk space! Yes, I made my kids sit in the trunk just to show how big the trunk space was! My 4.5 year old could lay down in the trunk and still wasn’t able to touch the front and back of the trunk. My 10 year old was comfortable and on our weekend trip to Disney there was plenty of room for our luggage and umbrella stroller. There was so much room that I could have packed for 2 weeks and still had space to spare! I’m insanely jealous over the trunk space in the Malibu Eco. No children were harmed in the making of these photos – the car was safely parked in our driveway at all times! I was really sad when the guys from the dealership had to come pick up the Malibu and I had to go back to my old car. If and when we decide to shop for cars again the Malibu will be on the top of my list of cars to shop for. It’s a great family (of 4-5) sized car with some amazing tech features! It’s not too shabby for the environment either – sure there is always room for improvement with environmental features but the Malibu Eco is making progress and gets a A- in my books! Now I feel the need to go have my car professionally detailed so it feels like new! When was the last time you looked under your child’s car seat?? 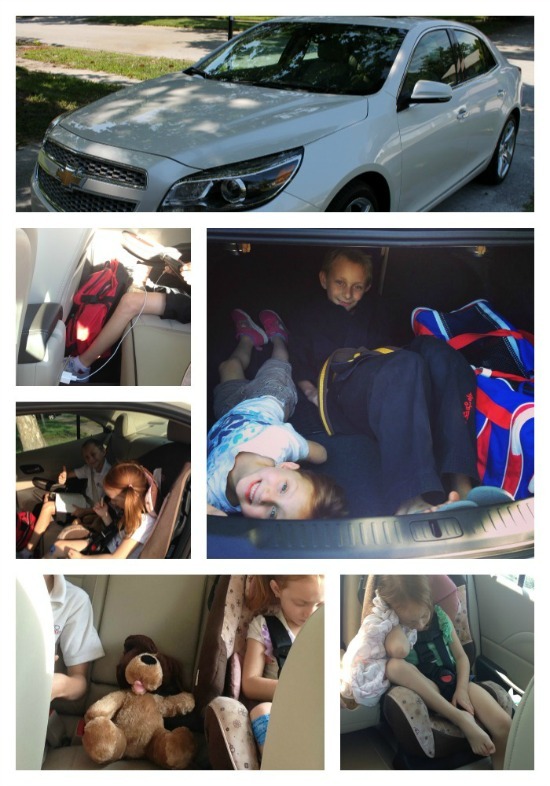 Disclosure: Chevrolet loaned the Chevy Malibu to our family for the purpose of this review.